When class size and floor space is limited, we recognize the need for other solutions: secure Chromebook charging stations and lockers as well as small, portable, cart-free charging stations for testing and outside-the-classroom experiences. Ensemble | The Ensemble series adds security and storage space to learning environments with limited square footage. 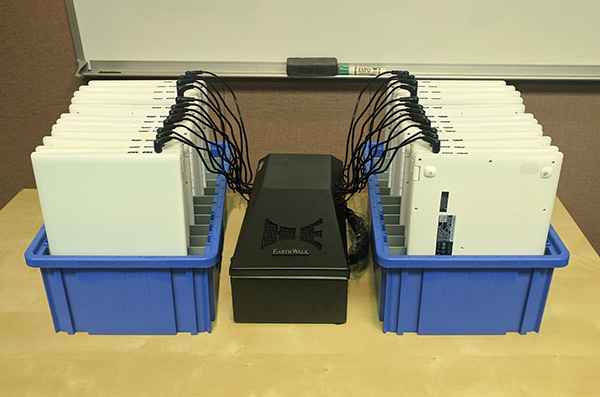 These stackable table-top modules can provide stationary security and charging. They can be deployed side by side and are available with integrated charging systems, storage drawers, laminate tops and color options […MORE]. HE Power Hub | This is a plug-and-play system: no set-up required. Simultaneous charging of all devices with no timers or switches needed. Ideal solution for testing—never lose power. Perform maintenance and updates to multiple devices all at once […MORE]. Click the button below to find an EarthWalk rep who covers your area. We can provide product information specifically based on your technology and budgetary needs. Which device do you need to support?